Filled with emotional depth, Violetta in "La Traviata" is one of opera's most glorious heroines. Verdi's sumptuous masterpiece recently returned to La Scala in Milan. The cast includes the luminous soprano Angel Blue passionately interprets the tragic heroine, alongside the legendary Plácido Domingo. "I've lived with the opera I'd say since I was 16 years old and then of course over the next years I'd find myself really just enamoured with the opera and honestly never dreaming that I would actually have the opportunity to sing it at La Scala," Blue told Euronews. The opera is one of the world's most frequently performed. This production’s conductor –Marco Armiliato – explained its enduring appeal. "La Traviata is a timeless masterpiece. Every note feels always new, every bar has something new and our goal has to be always to keep the music fresh and young." Verdi based the opera on the life of Parisian courtesan who is shunned by society. She, ultimately, dies of excess. "I do believe she's a woman who is smart and above all else she's a very humble woman. I think the idea that someone can be truly in their heart a good person but maybe they have a job that other people don't regard as respectful, people will look down on that person and I think that theme is universal". All the hallmarks of Verdi’s intimate involvement can be felt in the play, with a sophisticated development in Italian opera conventions to enhance his character portraits. Armiliato describes Verdi’s dramatic realism. "The characters that Verdi describes are so true and so real, that people can identify with these personalities, with Violetta, Alfredo Germont and the father." 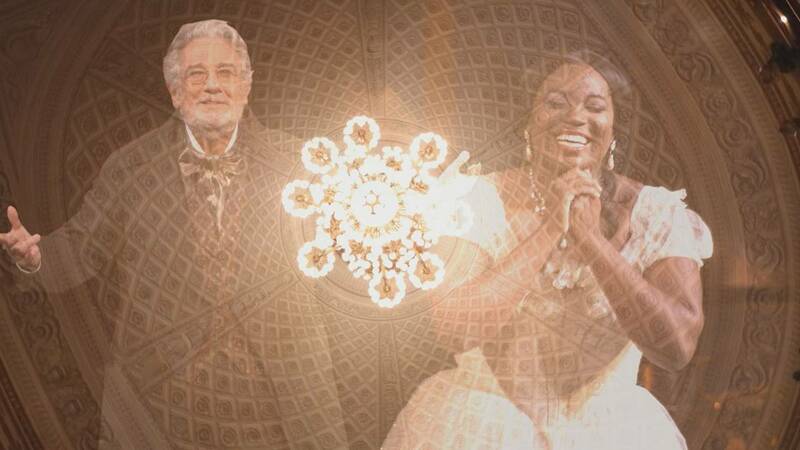 Singing next to Plácido Domingo – who interprets her lover's father – is inspiring for Operalia laureate Angel Blue (it was Domingo who founded the competition). "He has this just love and excitement and joy and just passion for the art. And it's not just the art of singing: It's music. And it just exudes off him. You can feel it, you know, and it's contagious." Blue told Euronews. The 34-year old California native sees boundless stoicism the character she plays. "When she says the joy and the pain it happens to all of us. She says 'la tomba ai mortali: the tomb of the mortal'. It's it confines us all. There's not one person that can escape it. And it's just the reality of life.” At this moment, Blue becomes teary-eyed: “Excuse me. Death is a part of life. And I think when I sing that moment, I'm just grateful for being right where I am at that time, which is singing that aria."